Jihadi Terrorist connected with 2002 Gandhinagar Akshardham temple attack arrested. Jihadi accused in 2002 Akshardham Hindu temple carnage in Gujarat arrested on the 10th anniversary of deadly 26/11 Mumbai attack. Sumit Patel | HENB | Ahmadabad | Nov 26, 2018:: On the very 10th anniversary of deadly 26/11 Mumbai attack+, Gujarat Crime Branch Police arrested an accused on Monday in the 2002 Akshardham temple terror attack case, moments after he alighted from a flight here. The arrest of the Pak trained Jihadi terrorist connected with Akshardham Hindu temple, came as a success after 16 years of the deadly attack commenced as to destabilized the peace and democracy in India. Mohammed Farooq Shaikh was nabbed by the Crime Branch from Ahmedabad airport, soon after his arrival from Riyadh in Saudi Arabia, Assistant Commissioner of Police Bhagrithsinh Gohil told PTI. Two armed terrorists were gunned down who had attacked the temple in Gandhinagar in the pick hours of visitors, killing 30 people and injuring eighty four on September 24, 2002. The attack followed the Godhra riots in the same year. 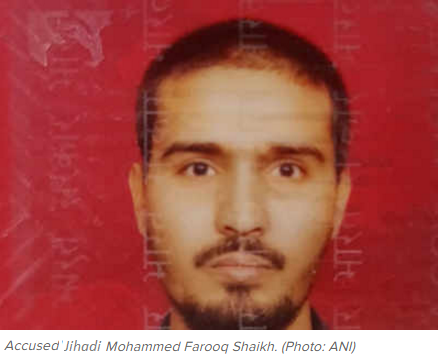 As per source, Mohammad Farook and another were sent as second line of support for the assigned Jihadi attack and fled from the scene for that time. “Shaikh lived in Juhapura before he fled to Riyadh in 2002 after the temple attack,” the police official said, adding Shaikh had arranged funds for the attack. On the very day of 26th November, 2008, the Financial Capital of India, Mumbai saw another deadly Islamic attack that left 166 people dead and over 300 people injured. Both the attacks were designed by the Pak Intelligence Agency ISI and the other Jihadi outfits found active both in Pakistan and India. This entry was posted on November 26, 2018 by hinduexistence in Anti-Hindu, Anti-Indian, Attack on Hindus in India, Attack on India, Attack upon Hindu Temple, Attack upon Hindu Temple by Muslims, Attack upon Hindus by Muslims, Breaking India by Pakistan, Conspiracy against Hindus, Conspiracy against Hindustan, Conspiracy against India, Islamic Aggression in India, Islamic Conpiracy against India, Islamic Conspiracy against Hindus, Islamic Conspiracy Against Peace and Humanity, Islamic Terrorism, Jihad in India and tagged 10th anniversary of deadly 26/11 Mumbai attack, Gujarat Police, Jihadi accused in 2002 Akshardham temple attack arrested, Mohammed Farooq Shaikh, Mumbai Police, Pak Jihadi Attacks in India.